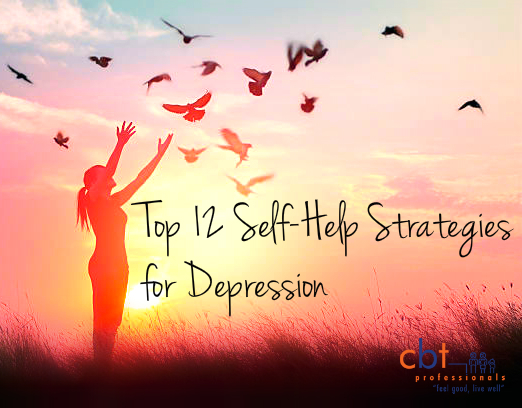 There are a variety of self-help strategies for depression you can explore to support you in dealing with depression. 3. Get into a regular exercise routine. Depression is linked with a lack of physical activity. There are many benefits to making exercise a part of your daily life. Getting active with exercise may improve your sleep, change the levels of chemicals in your brain improving your mood and create social opportunities with group exercise programs. You could try walking or running for 30 minutes, three times a week or building up to this if you haven’t exercised for a long time. Try out different types of exercise to find something you like (e.g. walking groups; classes at a fitness centre; swimming; team sports etc.). 4. Join a yoga class. Yoga may help with depression reducing stress, exercising the body and mind through meditation, breathing exercises and physical posturing. 5. Get into a healthy sleep routine having a wind down routine to go off to sleep, avoiding stimulants close to bed-time such as caffeine and nicotine, keeping ‘going to bed’ and ‘getting up’ to around the same time each day and limiting day naps to 30 minutes. 6. Eat a healthy, balanced diet. 7. Avoid alcohol. Having an alcohol problem can cause depression both in the short and long-term with changes to the brain and by leading to life problems such as job loss. It is important to be aware that if you have been drinking heavily for a long period, abruptly reducing or stopping your use of alcohol can lead to withdrawal symptoms, which can be life threatening. Please discuss your plans to reduce or stop alcohol with your Doctor. 8. Learn ways to relax. Anxiety can lead to depression and learning ways to relax can help deal with anxiety and depression. Learning progressive muscle relaxation is one method that involves working through the body tensing and relaxing the muscles. See the following link for further instructions (https://www.anxietybc.com/sites/default/files/MuscleRelaxation.pdf). 9. You could try massage therapy, which may help promote relaxation and an overall sense of well-being. 10. Make time every day to do something that you usually enjoy.Pleasant activities are the ‘want to’s’ rather than the ‘shoulds’. Be prepared with your personal menu of pleasant activities that you can choose from (e.g. spending time in nature; with pets; with a friend; with family; socialising, reading, watching a movie, listening to music, having a warm bath, meditation, arts and crafts activities etc.). Schedule the time each day that you will spend on your pleasant activity (e.g. 30-60 minutes). Keep track of how you go in dedicating time for things that you enjoy and work on solutions to any barriers that get in the way. 11. Vitamin deficiencies or being low in Iron or Vitamin D, and hormonal imbalances have been associated with depression and it may be helpful to speak to your GP about appropriate blood works to test for these levels. Speaking to a nutritionist or your local pharmacist about possible supplements that may assist with improving your mood, your energy levels and your well-being may also be beneficial. 12. Reach out to someone you trust and talk. This may be an opportunity to express your thoughts and feelings, explore different ideas about your problems and get support. Ask for support and let others help. Explore the option of a support group. Talk about your depression with your Doctor and consider whether you may benefit from psychological and/or medical interventions in conjunction with self-help strategies for depression. Psychological interventions can provide a confidential, supportive space in which to explore solutions to problems, learn positive coping strategies and healthy ways of dealing with emotions and support you in achieving meaningful goals and improving your life situation. For all you need to know about visiting a psychologist including referrals and what to expect, download our free ebook“Your 101 Guide to Visiting a Psychologist” here.